PSE's 2018 Drive X is a member of the company's Vapor Series Compound bows, an unsurpassed performance value. It features the MH Cam with speeds up to 332 fps. 80% let-off and mass weight is 3.7# with 30" axle-to-axle length. The Roland riser is a strong composite material, drilled and tapped for sight and stabiliser. There are two riser lengths for 62" or 66" total length. Order it in red or blue, and it is available in left- or right-handed. The limbs are wood-laminated white limbs are not adjustable, but can be ordered in draw weights between 16# - 30#, in 2# increments. If we do not have the exact weight in stock, we can order it for you. The Roland-Bulleye Takedown is priced at $169.00. The purchase of this bow comes with coaching and set-up, a $70 value. 2018 Stinger Extreme features SX single cam is engineered on a new and upgraded riser platform and has upgraded limb pockets. Package includes Gemini sight, Whisker Biscuit arrow rest, Hunter quiver, FX-4 stabilizer, peep, bow sling, and string loop. Any bow purchased at South Nation Archery Supply includes a two-hour set-up session at no charge, a $70 value. The outstanding value-packed price of this package is $559.00. The SF Axiom is an excellent intermediate-level recurve bow featuring a 25" aluminum riser and universal interchangeable limb pockets to accept any high-performance limb. The riser is offered in 5 colours, in right- or left-handed. Limb lengths available: 64" 66" and 68". Limb weights are available from 16-36# in 2# increments. 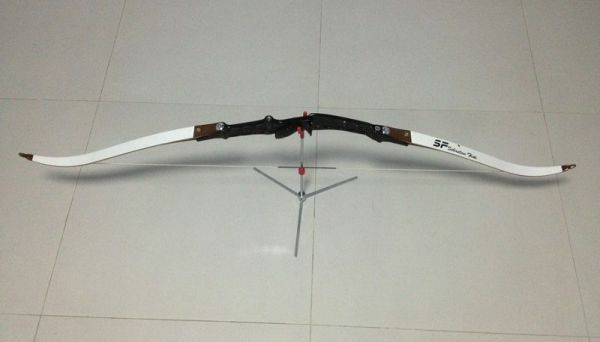 SF Axiom is one of the finest values in the archery industry for intermediate and beginner recurve archers. South Nation's price is $399.00, which includes one hour of free coaching with the purchase of the bow.